Short Stories, Light and Dark | Blah! I just finished two collections of short stories, chosen seemingly at random. I basically picked these up because their covers intrigued me, having heard nothing about them. Also, I’m a fan of short stories as they are often a quick read but can contain very powerful statements about the human situation. These two collections are very different. 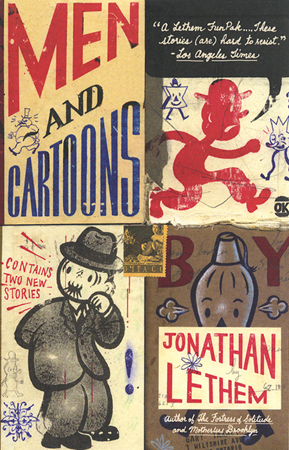 The first, Men and Cartoons by Jonathan Lethem, is an exploration, in some sense, of the superhero genre, though some of the stories touch more on science fiction than pure superheroics. But, more than that, these are just devices for Lethem to explore human personalities. In some cases, the protagonists aren’t even human, like in Interview with the Crab, in which a crab, who starred in a sit-com as a youngster, is interviewed in his later years about his fame and fortune. Super Goat Man is about one near-hero, a guy who really has no powers except he looks a bit like a goat, and how he never lives up to being a hero. All of these stories explore different quirks of people. At times, I felt the stories were a little flat, though there were definitely times, like in The Spray and The Shape We’re In, which describes a cell’s adventures in a human body, when I wondered how the hell he came up with this stuff. Some of the stories are definitely inventive and pretty way out there, making the overall collection well worth the read, even if in a couple of cases, I was growing a little bored. 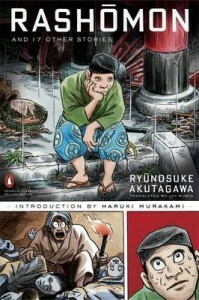 The second collection is Rashomon by Ryunosuke Akutagawa. I was intrigued by the title as I had seen the movie Rashomon by Akira Kurasawa in college, a movie which I really enjoyed and highly recommend. It wasn’t clear to me there was a connection, but I picked it up anyways. And, indeed, there is a connection. Though, it is a little convoluted, as Akutagawa’s story Rashomon has little to do with the movie. It is rather In a Bamboo Grove that inspired the movie Rashomon. 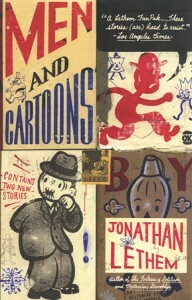 I enjoyed most of the stories in this collection. They start out with his fiction, usually set in feudal Japan, and explore the human experience by putting people in odd situations. In a Bamboo Grove describes a death from multiple perspectives, giving each person’s take on what happened, including the victim. Hell Screen is about a painter who is commissioned to paint a screen with the Bhuddist hell depicted on it and the events that occur to complete the painting. The later stories move into more modern territory, but no less odd events. One describes a man who dies at the wrong time and is returned to life with the legs of a horse as his had already rotted. The last few stories are more autobiographical and describe Akutagawa’s descent into madness (he ultimately committed suicide). While I think it is very hard to convey the despair that someone must go through in such a state. I’ve read Plath’s The Bell Jar and just didn’t feel the anguish she was trying to convey. I feel it a little bit more here, as Akutagawa describes the random things that end up tormenting him. In all the stories, Akutagawa has a unique perspective and is inventive in his subjects. This is another collection that I enjoyed and would recommend.